I remember thinking the message was profound. A simple way of letting my budding little life know he was loved, appreciated. And, who doesn’t like a smile thrown their way? I was also fairly confident it was something I could pull off while wandering around in my then sleepless stupor. And so after naps, during diaper changes, feeding time, car seat transitions, I’d try to remember to: smile. Not a big toothy “yippee” smile but an “I’m so glad you’re mine” smile. John started to smile back. And, I realized the smile regimen was as good for me as it was for him. Ten years later, I no longer consciously think to smile when my boys walk in the room (I hope by now it’s a habit). And let’s face it when cooing babies turn into tantrumy toddlers and precocious pre-teens, all that smiling can be a little more...um, challenging. 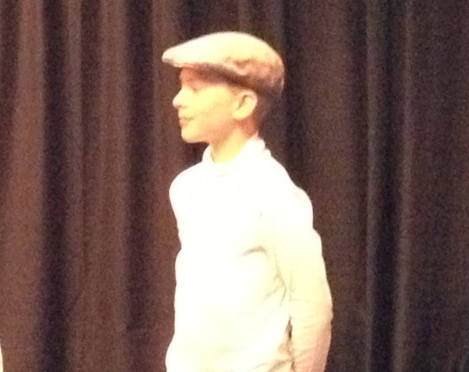 Last weekend John performed in his first musical theatrical production. 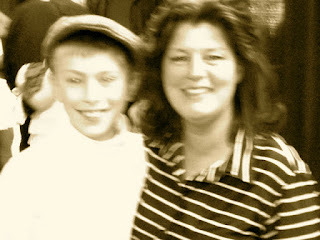 For regular readers of this blog, this was the performance that I kinda sorta had him audition for without him knowing. He is after all, my reluctant joiner, who prefers school and home to “out there” endeavors. John loved his time at the Children’s Theatre. Every Saturday he happily attended rehearsals, without ever once saying, “Do I have to go?” And he was excited to share his production with the steady stream of family and friends who attended. Knowing how happy he’d been rehearsing and how excited he was to be part of the production, I was a little surprised to see how timid he was as we watched the first production. It was clear he was having a good time but he wasn’t his usual self. I approached the subject delicately on the way home in the car. “How did it feel to be up there?” I asked. “Some people are smile-challenged John,” I responded. “Smiling isn’t their thing,” I said. The next afternoon I arrived an hour early with John. Before he left to join his cast mates, John directed me to the area where he wanted me to sit. Second row, stage right. Forty minutes later a familiar face walked through the door. It was Mrs. Bankers, from John’s school. Seeing her always-present smile, made me smile, for so many reasons. Mrs. Bankers routinely lights up the Buttonball Lane Elementary School office. She is the kind of person that notices, everything. She’s never too busy to say hello or offer comfort. She senses when a child (or a parent) is lost or not feeling quite right. Her joy is contagious. “Thanks for saving me a seat,” she said with her trademark smile. Thanks for bringing your smile, I thought. As the lights dimmed and the music began, I could see John’s big blue eyes poke out from the back of the curtain. As soon as he saw us in our strategically appointed seats, I could see him smile. Over the next hour and a half we sat in the little theatre watching children ranging from seven to seventeen sing, dance and act their hearts out while we laughed, clapped and shed a tear or two. I could see John’s confidence grow with each passing song. With each passing smile. I know I won’t always be able to be John’s surrogate smiler, willing him through every nerve wracking endeavor. But I hope he’ll always remember: Smiles are catchy. And like good advice, they never grow old. Oh Holly, This one got me. I was so choked up by the end. What a wonderful lesson/observation. It's so true. Smiles are contagious! :) well done you.